There are different types of camshaft timing gear bolts. Make sure to check the identification mark to determine the tightening torque. 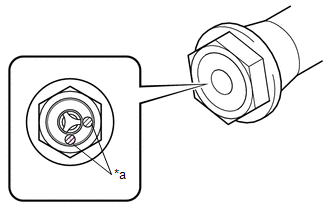 (a) Apply engine oil to the areas of the camshaft timing gear bolt shown in the illustration. (b) Temporarily install the camshaft timing gear bolt. Make sure that the flange part of the camshaft timing gear bolt is directly contacting the camshaft timing gear assembly. 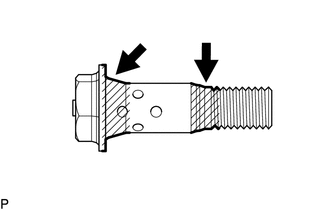 (c) Loosen the camshaft timing gear bolt 60 to 180°. 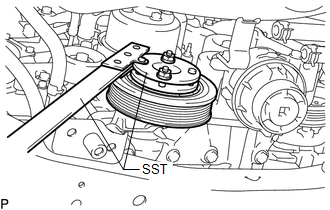 (d) Using SST, hold the crankshaft pulley assembly. (e) Tighten the camshaft timing gear bolt.